Identification: Upperside is dark with yellowish spots. 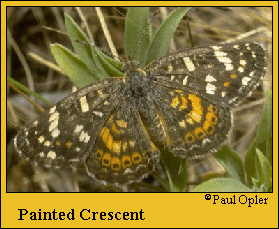 Below, forewing apex and all of hindwing are yellow-cream with pale or absent markings. Life history: Males patrol on flats all day for females. Eggs are laid in clusters on underside of host plant leaves; caterpillars eat leaves. Third-stage caterpillars hibernate. Flight: Two to three flights from April-October. Caterpillar hosts: Field bindweed (Convolvulus arvensis), aster, and hairy tubetongue (Siphonoglosssa pilosella). Habitat: Marshes, stream edges, and washes in short-grass prairie; fields, roadsides, fencerows. Range: Nebraska, Kansas, and Colorado south to Texas, New Mexico, and western Arizona; northern Mexico.